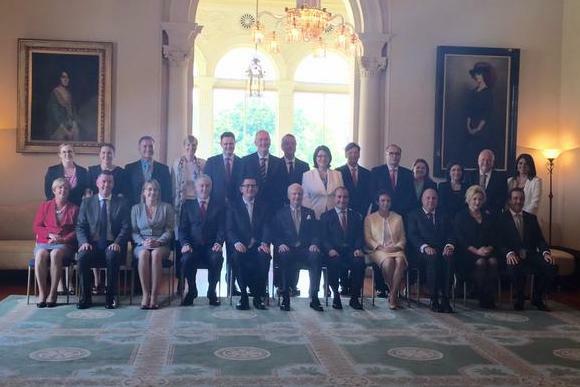 Daniel Andrews has been officially sworn in as the 48th Premier of Victoria during a ceremony at Government House. Mr Andrews, who led Labor to victory at Satuday's state election with a swing to party of 2.6 per cent, also unveiled his first cabinet. One noticeable highlight was the nine women sworn in as ministers, with many given prominent portfolios including health, public transport, employment and the new prevention of family violence role. Mr Andrews said his team would “make Victoria stronger, fairer and better”. “We’ve matched experience with fresh ideas and we’re hitting the ground running." He said the new government would begin work on a raft of election promises including ending the paramedics pay dispute, removing level crossings and funding TAFE.